TRIAC DRIVE AT: The all-purpose hot air tool This unique, semiautomatic welding tool is so lightweight and easy to handle it can be used anywhere. Its innovative hot-air unit, TRIAC AT, sets real benchmarks. The fl exible concept makes the TRIAC DRIVE AT an all-round tool that is universal in use. 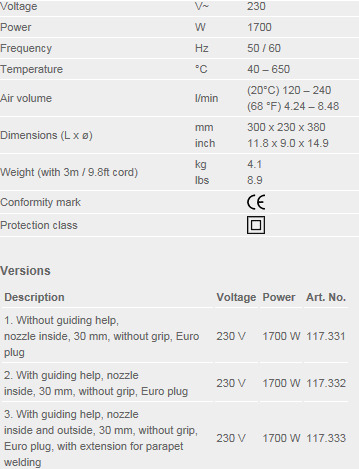 Depending on the weld overlap and application, a inside nozzle or outside nozzle are available.